How were djinn traditionally depicted in pre-Islamic Arabic myth? 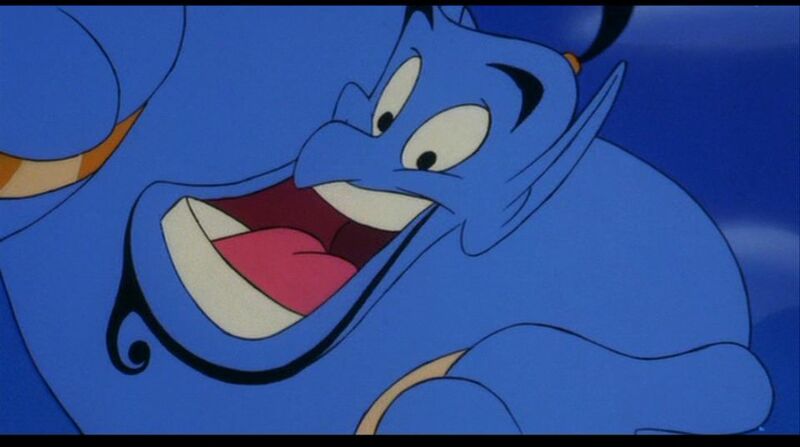 Today, many people are aware of "genies" as beings from Arabic myth, mostly thanks to Disney's Aladdin. Other works of fantasy have often co-opted djinn as creatures in their worlds. But Disney's depiction of a genie is, shall we say, cartoonish, and surely does not resemble the djinn of Arabic mythology. How were they traditionally depicted (in terms of their physical portrayal)? Textual sources and art would both be helpful here. I'm drawing my information for this answer from my reading of the doctoral dissertation of Amira El-Zein, titled "The Evolution of the Concept of the Jinn from Pre-Islam to Islam". I have attempted to summarize extremely briefly a few salient bits, particularly from pages 65-98. However, as it turns out, this topic is actually fairly complex, so giving it a read would be recommended: The Evolution of the Concept of the Jinn from Pre-Islam to Islam. Jinn is a classification of a number of different types of supernatural being. They may be either good or bad, and there is no clear demarcation between types of jinn as either strictly good or strictly evil. They could appear as pure spiritual beings, as stand ins for angels or demons, as indicated by Ibn Manẓūr, in "Lisān al-ʿArab"
They could also be tangible creatures, particularly with animal-like characteristics, as stated by "The Encyclopedia of Religion and Ethics"
...were not pure spirits, for they were often represented as hairy and often as having the form of an ostrich or a snake." I spent the night leaning on her, waiting for the morning to see what I caught. Then I found two eyes in an ugly head, similar to the head of a cat with a forked tongue. Si'lah - The difference between this and the former is not clear to me. They seem to be more sneaky and clever. A story exists of a one marrying and bearing human children. Possible other differences may be that they are active during the day, instead of at night, or that the Se'lah is female, and the Ghūl male. neither seems to be universally respected though. There, a shiqq appeared to him. He had only one hand, one eye, one leg. They recited poetry to each other, then they hit each other, and both of them fell dead. Shaytān - They are noted for being smart, cunning and powerful. And generally rebellious. May or may not be a loan word from Hebrew, but still not necessarily evil. ʻIfrīt, Qutrub and Mārid - Not well-known in pre-islamic time. In Islamic theology, jinn are said to be creatures with free will, made from smokeless fire by Allah as humans were made of clay, among other things. They are usually invisible to humans, but humans do appear clearly to jinn, as they can possess them. Clearly, this contradicts the existence of depictions of jinn. A ghul or ghoul is said to be a desert dwelling, shape shifting demon. It is said to commonly take the appearance of a hyena. Legends about the ghul inform that the ghul takes the appearance of whatever it last devoured. An ifrit is an enormous winged creature of fire, either male or female, who lives underground and frequents ruins. They are said to be the female creatures that fall under the jinn category. However, they're immutable in shape and appear in the guise of an attractive young woman. They are not trully invisible but live in a sort of parrallel world a bit like islandic fae. they co-exist, or occupy the same space as humans so there are sometimes interactions, including cross-species marriages. In some legends they have knowledge of treasures but in others they are just like us. I also remember another type with is similar to nagas, they are woman headed great snakes that can slide upright thought the desert. Don't ask for references, this is from stories I vaguely remember from childhood. I think that one of the problems is that these terms are wiledly used in arabic for various supernatural phenomenon. djins are also blamed for possessions, hauntings and mental illnesses. Ghul is also a broad term that emcompasses beasts, monsters, scary things or any frightning uncontrolable entity. The surest way to hunt down the pre-islamic roots is through Jewish, Babylonian, and Assyrian mythology. Some ancient Egyptian images were worked into later mythology in the area (Bes, for instance.) A source for "Less-than-deities" in ancient Egypt is Egyptologist Kasia Szpakowska's DemonThings blog. It might be worth checking. Not the answer you're looking for? Browse other questions tagged arabic or ask your own question.